Tel Aviv/Geneva, 29 August 2015 – Leading scientists from across the globe are meeting in Tel Aviv, Israel, from 30 August to 3 September 2015 for the 28th meeting of the Animals Committee of the Convention on International Trade in Endangered Species of Wild Fauna and Flora (CITES). Over 200 delegates from more than 50 countries are expected to attend the meeting, including observers from Parties, intergovernmental bodies, non-governmental organizations and private businesses. The conservation status and exploitation levels of flagship CITES-listed species such as polar bear, African lion and hippopotamus, and several other species, including pangolins, sharks, snakes, stingrays and sturgeons will come under close scientific scrutiny this week. Other items on the agenda will include the development of guidelines for CITES Parties to evaluate the sustainability of international trade in tortoises and freshwater turtles, and regional cooperation on the management of, and trade in queen conch. The Committee will also review the implementation of the Convention relating to production systems of captive-bred and ranched animals, and the cooperation with other biodiversity-related multilateral environmental agreements. Commenting on the significance of the meeting CITES Secretary General John E. Scanlon stated "the science-based recommendations reached at meetings of the Animals Committee provide the Parties to CITES with the best available scientific advice to guide their decision-making on the conservation and sustainable use of wildlife." "We are most grateful to the Government and the people of Israel for hosting this critical meeting, which takes on particular significance as we prepare for the 17th meeting of the Conference of the Parties to be held in Johannesburg, South Africa, in September 2016 " added Scanlon. 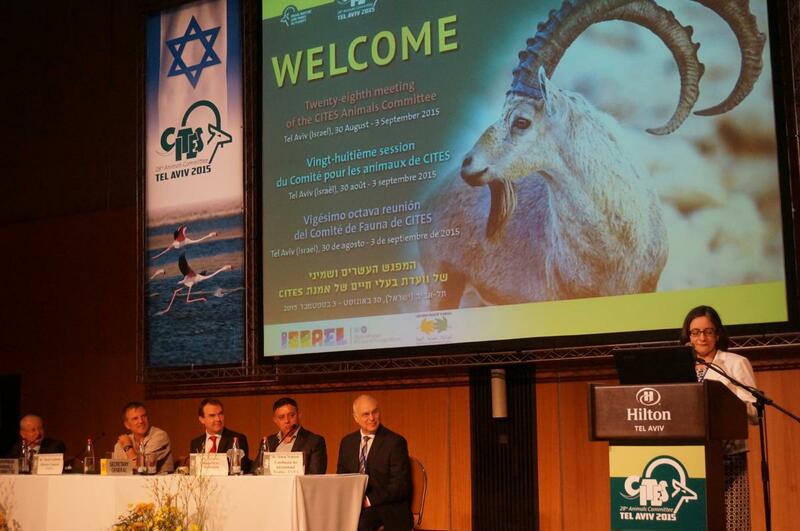 This is the first time a meeting of a CITES body is being held in Israel in the 40+ year history of the Convention. The Israeli Minister of the Environment, Mr. Avi Gabai, formally opened the meeting, together with the General Director of Israel Nature and Parks Authority (INPA), Mr. Shaul Goldstein, Deputy Director General, Head of UN and International Organizations Division of the Ministry of Foreign Affairs, Mr. Aharon Leshno Yaar, Chair of Animals Committee, Ms. Carolina Caceres, and CITES Secretary-General, Mr John E. Scanlon. To mark the occasion the CITES Management Authority of Israel is also organizing a special public symposium on international and domestic environmental law at which the CITES Secretary-General will deliver a keynote address on ‘CITES and Wildlife Trade – International cooperation and national action’. The Animals Committee provides the technical and scientific basis for the implementation of the Convention as far as fauna is concerned, ensuring that CITES decision-making has a sound scientific basis. The meeting of the Animals Committee will consider issues regarding a wide range of animals that are traded amongst other things as food products, skins, traditional medicines, tourist souvenirs or pets in the international market. Discussions on the sustainability of international trade in sharks and snakes are likely to dominate the meeting. Sharks are traded internationally in significant volumes and are vulnerable to overexploitation owing to their late maturity, longevity and low fecundity. Unregulated and unreported trade is contributing to the unsustainable fishing of a number of shark species. For this reason, several commercially valuable shark species were listed on CITES Appendix II in 2013. The Animals Committee will now examine information submitted by Parties and range States on how they are implementing these listings, including how they assess that trade in specific shark species is not detrimental to their survival. Snakes are bred in high numbers in certain countries to supply the demand for food, skins, and pets. The harvesting of snakes, and in some cases the processing of their skins and other body parts, is of economic importance and contributes important revenue to local communities. However, unregulated or unsustainable trade in snakes can pose a significant threat to wild snake populations, and enhanced international cooperation is needed to address these threats. The Animals Committee will review the latest scientific findings on snake production systems, assess the conservation status of snake species in international trade, and develop guidance to assist Parties and range States in ensuring that trade in snakes and snake products is sustainable. The Committee will also start developing guidance for a traceability systems for snake skins.